Imagine Luke's milky beard in 4K! Were you a big fan of Star Wars: The Last Jedi? Then you're in luck, as the movie is getting a 4K Blu-ray release, with director Rian Johnson's latest epic from the galaxy far, far away the first film in the series to get the pixel-pushing UHD treatment. 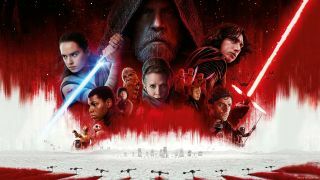 Revealed in a trailer-packed tweet from the Star Wars Twitter account, Disney has revealed that the Star Wars: The Last Jedi 4K Blu-ray release date has been set for March 27. That's the same date as the regular Blu-ray release, while those looking for a digital download of the movie will be able to get it a little earlier, on March 13, via the Movies Anywhere service. Despite enjoying critical acclaim, The Last Jedi has been perhaps the most divisive of all the Star Wars films among fans, who were at least united in their hatred of the prequel trilogy. Johnson's movie split fans right down the middle, with many singing its praises as bold and wonderful, while others felt it strayed too far from the norms established by earlier installments. Whichever side of the fence you fall on though, the home video release looks to serve you well, with a host of features (including a movie-length documentary in which the director explains all his controversial choices), alongside a whopping 14 deleted scenes. The Director and the Jedi Go deep behind the scenes with writer-director Rian Johnson on an intimate and personal journey through the production of the movie – and experience what it’s like to helm a global franchise and cultural phenomenon. Balance of the Force Explore the mythology of the Force and why Rian Johnson chose to interpret its role in such a unique way. Lighting the Spark Creating the Space Battle – Get a close-up look at the epic space battle, from the sounds that help propel the action, through the practical and visual effects, to the characters who bring it all to life. Snoke and Mirrors Motion capture and Star Wars collide as the filmmakers take us through the detailed process of creating the movie’s malevolent master villain. Andy Serkis Live! (One Night Only) Writer-director Rian Johnson presents two exclusive sequences from the movie featuring Andy Serkis’ riveting, raw on-set performance before his digital makeover into Snoke. Deleted Scenes With an introduction and optional commentary by writer-director Rian Johnson. Audio Commentary View the movie with in-depth feature audio commentary by writer-director Rian Johnson. You can pre-order Star Wars: The Last Jedi 4K Blu-ray from Amazon here.